Que saudade! Que lastima! Nakata Sae‘s arc is over. 4 episodes is just too short…won’t be able to see her anymore. Don’t know what to do… How can I live without her? A flower in this barren 3-D world. Hannah’s hope amid nuclear destruction of Nagasaki. Sae-chan’s character song, “Anata shika mienai (You’re the only one I can see).” Yes, love is blind. She can only see her loved one she wants to run away and elope. The sweet tune of bossa nova. The central philosophy of bossa is saudade. Ah, I listen to her song every night, so I can sleep moetically. Ah, how nostalgic. How sensible. How romantic. Bossa nova totally fits her! Softness, the embodiment of sensible femininity. Her whisper voice! I love girl’s whispering. The cutest yet most sensual of all. No girl has romantically whispered in my ear… That’s why it’s the most appealing vocal style to me. Kahimi Karie’s song for Chibi Maruko-chan‘s OP was just awesome! Ahh, so cute! Oh, and this song from Welcome to N.H.K. It’s just…made me think about converting to Jehovah Witness at one point, so I could meet Misaki-chan. Ahhhhhh! Evangelion’s ED, the first song of bossa nova I’ve ever heard in my life. It was simply shocking. I didn’t know this kind of beautiful music existed in the world of terror. The upside down Ayanami Rei’s silhouette rotating above the lunar reflection on the sea. A girl walking on the water! What an impressionistic scene… It was a premonition. It was a sign. It was a miracle. Providence to run away from the reality (3-D) to the new frontier. From the land of the oppressed to the land of free. The land of individuation. Fly me away from society that reproached me. And now again, I really wanna run away. America once again proved to be 3-D, the recent failure of DADT repeal tells itself. Change won’t happen. And girls are still the same, only going out with macho men, not sensitive otakus like me. Most of the time what I’ve been hearing is “I already got boyfriend,” a couple times “I’m married,” and a very few times “Get lost, nerd!” Everywhere I go, I am told to get lost. In Japan, “Get lost, kimo-ota!” And here, especially a place like Arizona, “Get lost, gaijin!” So, 2-D is the only place I can feel safe and accepted, where girls won’t reject me, especially Sae-chan. She’s the only girl who asks me if I have a girlfriend, making me obento, and even calling me oniichan (older brother)! Moe~! But the fact that Sae-chan’s gone got me really bad. 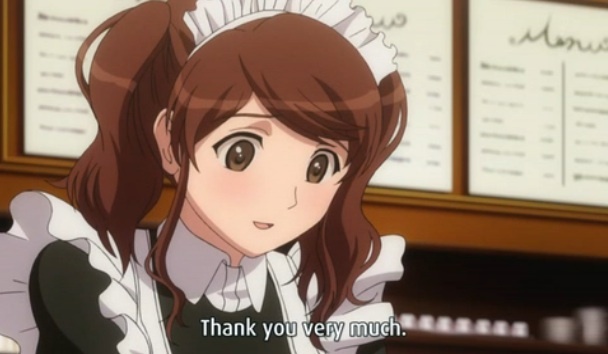 I don’t know if I can continue to watch Amagami SS without her. So, Alone Again, Naturally. Once used for Maison Ikkoku‘s OP. Yes, a loser hero, Godai-kun. Hey man, I just have to say: it’s a great pleasure to read your articles, every time again. You really seem like an interesting person to me. How old are you if I may ask? When you say ”women like macho man”, I have to agree. I may be wrong, but I think it’s the same principle with man liking women with big breast… Bad comparison by the way, but I think you get my point :) It’s just that women like men who take are handsome, strong, take the lead, and are a bit brutal. ie: macho-man. I’d do anything to make anime (or at least Sae-chan), turn into reality. I think I’m kinda obsessed with it. However, being called a ‘gaijin’ in a country which you expected to find happiness, must be quite painful. Especially when you find out the county is no different from Japan, where you came from. Well mate, I guess we have to bear with it, live is hard. Maybe heaven is better? Hahahahaha!!! Thank you! Awesome comment! I think we got the same brainwave! Yes, Sae-chan is No. 1! Embodiment of cuteness! Definitely heaven sent. Utterly therapeutic. She’s got a fair size of breast although she’s like less than 5 feet tall. Well, I like a girl with small chest too, no problem. Yeah, I hear ya, 3-D girls are always aroused by machomen, which is evolutionarily challenging. I don’t know if heaven really exists, but I’m sure 2-D exists. I’m always 17 years old, and that’s my authentic age in 2-D, eternal youth, 17 forever. On the other hand, my age on government ID is a 3-D thing, mundane bullsh#t, full of phoniness, so I don’t consider that my real age. Yeah, this is not ‘real’ America, but NAFTA, though we got first black president, but figured out sooner or later that he wasn’t our messiah. 3-D can never have a messiah. 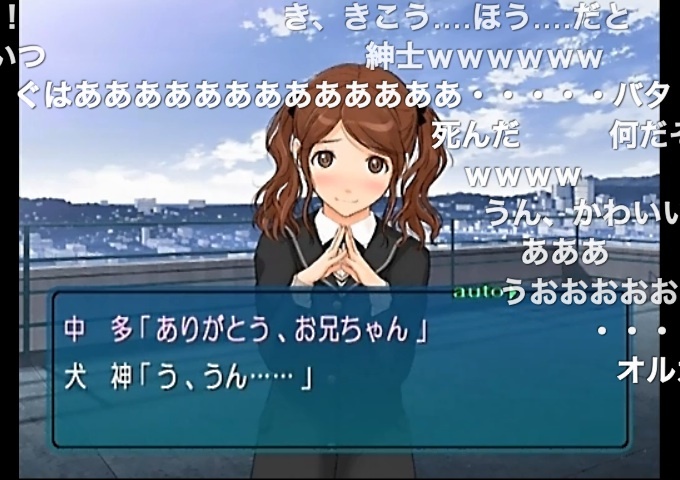 So, anime, like Amagami SS, is my salvation, especially Nakata Sae! P.S. Your English is good! Mine is as bad as Gov. Schwarzenegger. Too bad he screwed up, so immigrants will be seen as incompetent, tougher time ahead for us. It’s kinda incomprehensible why woman can’t like an intelligent and understanding man like you. They’d rather pick some macho dude with a lot of muscles, instead of somebody with brains who can fully understand how they really feel and love them the way they are. At least, I wish there was a way to manipulate dreams, so we could be in 2-D world while we sleep (together with Sae-chan… =3). You’re as young as you feel, real age doesn’t mean anything. Just some numbers. I think age is just something stupid humans invented, and people judge each other by it. But I’m curious, how can you be that confident about the existence of the 2-D world? 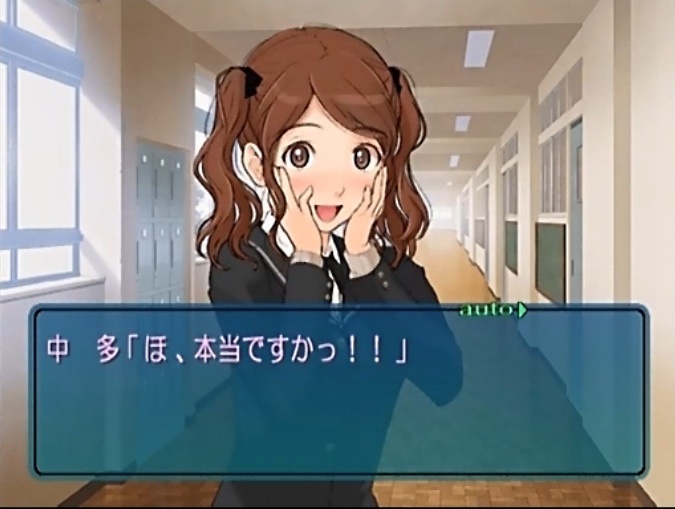 Also too bad Tachibana didn’t like Sakurai, cause she was pretty cute too! P.S. You’ve got to be kidding me man, your English is perfect! Thank you for the links! Ahh, how awesome, heaven sent! How I wish I could take sauna bath with Morishima-senpai! Ahh, I want to ride a bike with Kaoru! That was one of my dreams in high school, futari-nori (two people ride together on bike) and go home together afterschool. Bicycle date! That reminds me of a Chinese movie, 17 Years Old Bicycle (Beijing Bicycle), fancying about Yuanyuan. But Yuanyuan is still a 3-D girl, plus she ages. In turn, Sae-chan is definitely our moetical girl. She’s young forever. She even makes us obento, which I never got in high school! You said it right, comrade! Yes, lucid dream, so we can have fun with Sae-chan! You know, my only hope is 2-D, so 2-D should exist. Because I always see it on LCD screen. By watching Amagami SS and especially Sae-chan, I know that 2-D exists. Seeing is believing! So, you’re 2 years younger than 17, the best age of all according to Inoue Kikuko, the cult leader of the 17 years old cult. That’s great that girls are nice to you! I didn’t have a chance to talk to girls, since they avoided me. I think gentle boys looked wimpy and creepy in the eyes of girls, at least in Japan and America, I don’t know about EU. I hear in Sweden sensitive guys are popular among girls, very different from machocratic America. Do you mind asking where you’re from? I don’t know if it gives a same satisfaction as having a 3-D girlfriend. Other otakus who have dated 3-D girls are saying 2-D girls are hell a lot better, I mean incomparable. Some say it’s even blasphemous to compare 2-D girls with mundane women. You’re right, it’s incomprehensible. Not sure why 3-D girls go for men with violent traits, such as mafia, gang, yakuza, hooligans, hoodlums, dictators, rapists, religious extremists, terrorists, and etc. This awful truth has only made me think that 3-D women are evolutionarily challenged. Also machismo has put women down for a long time, forcing them to be obedient housewives. So, that also has slowed down women’s evolution. It’s really recent that women start having important social positions, so they haven’t got used to the new social roles yet. Therefore, they still suffer from a sense of weakness = insecurity. But more women are breaking the glass ceiling, so as time goes by, I believe women will be independent, and then there’ll be no reason for macho-men to exist, so macho-men will eventually extinct from earth, as their fate is the same with dinosaurs. The 3-D world is like Jurassic Park, or machocracy. I see the current trend of religious extremism is like an attempt to artificially revive dinosaurs. So, it might take generations to dismantle it. Yet, by the time women become independent, I would be an old geezer. Who would date me by then? It’d be too late. That’s why I want to be young forever. Only 2-D can guarantee eternal youth, 17 forever… In 3-D I’m not 17 anymore…I want to cry on Sae-chan’s laps. Anyway, thank you very much for the comments. Thank you for understanding me! Namaste! Hello there again, Monsieur LaMoe! Sorry for this late response! However, I’ve uploaded both of ’em again, but as a file on the internet, LOL. But hey, every time you say ‘moetical’ or ‘moetically’, I don’t know what you’re talking about, haha. Perhaps you can explain the word? I actually don’t know about Sweden, but I’d say it’s very likely to be true what’s said about woman there. Because I live in the Netherlands, and a lot of girls prefer sensitive man too. Of course, the most of them (maybe 65%) here prefer macho-man, but there are still plenty of others left who think differently! If some 16/17 year old macho-boy here would start bullying the weak, he’d not be found attractive by the girls at all. I agree with your theory that this all has to do with some sort of human evolution. But still, I don’t think we’ll have to wait for another human evolution in the US, Japan, or wherever; wherein girls specifically like sensitive man. Eventually we only need one girl/woman to love and marry… Just one out of the whole bunch. Thank you for responding! “Moetical” is an adjective of “Moe.” Like poem, poet, poetic, poetical, poetically. I see, so 3.5 out of 10 girls will love sensitive boys then! Awesome. Ahh, how I wish I grew up in EU instead of Japan. Maybe I should move to the Netherlands. Yes, if I can get a blue card, I can go any country in EU. Probably visit Sweden. That would be awesome. That’s totally awesome that girls over there would see bully a jerk. It’s great that Dutch girls completely turn down machismo! Here in America, I never get helped by girls. If I beg them for help, clinging to their legs, they’ll spit on me. They are really harsh. The poor victims of market fundamentalism like me have been completely run over by the hedge-fund managers who are making thousands an hour while we’ve been struggling to make ends meet. Bullies at Wall Street, winner-takes-all. At Main Street, some living off unemployment benefit looking for work. Youth’s unemployment rate is over 20% here. Thank you for agreeing with me! Right, I was really hoping so. I was very optimistic three years ago, yet nothing has happened to me, nothing has changed, and we don’t have much time left until 2012. I haven’t seen any sign. Maybe I should move to West Europe or Brazil, or South America. I hear they have far more skinship than NAFTA. But I don’t have enough money to move, lack of wealth also reminds me of harsh 3-D world, so I best go to 2-D, unreal world, having moe on 2-D girls.